These stove cooking sets are the most compact, convenient way of carrying around everything you need to whip up breakfast, lunch and dinner on the camping trail. No more hauling around pots and pans, and no need to spend a fortune of self-heating packets of food. Just un-stack one of these portable cooking sets, and away you go. The cook pot is big enough to cook food for several people, and the 1.6L kettle is big enough to make tea and coffee for 4-6 people. For all its features, the Kelly Kettle kit isn’t incredibly heavy, weighing in at 2.2kg. At 34cm (13in), the kettle itself is the largest part of the kit, and the whole thing comes in a durable Kelly Kettle branded bag. The main cooking pot has a capacity of around .85L, so not inconsiderable, and fine for the small, but calorie-rich foods you tend to cook when camping. One of the best Cooking Sets available. Often the problem with these multi-sets, is that their creators get so caught up in offering as many components as possible, that quality goes out the window. The Kelly Kettle Company prides itself on quality, and on building stuff that lasts. We certainly believe them, and the stainless steel finish is a real confidence booster. This kit will last for years. 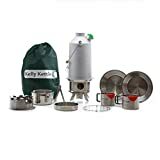 There are novelties with the Kelly Kettle kit, everything works as it should, as you’d expect it to, standing up to harsh conditions, and not bending or flexing like cheaper sets might. The burner is a biomass burner, which is something we love. Burn twigs, wood and pinecones instead of gas or coal. No restrictions on travelling with the Kelly Kettle kit, either. The durable carry bag opens with a simple drawstring, so you can pack up and pack out quickly and easily. We also love the mouth guards on the cups, which are there to stop you from burning your lips. The Esbit is one of those ‘born out of necessity’ things, just big enough to heat food and drink for a single person, and light enough to cram into your rucksack. With a folding handle and the option to use Esbit’s very own solid state fuel cubes, there’s something wholly satisfying about using this particular stove set. At 198g, the Esbit is lighter than a can of coke, and a whole lot better for you. It isn’t huge, with around 585 ml of volume inside the cup, but that’s just enough for soup or a hot drink, or for boiling water to heat up sachet meals. Made from hardened, anodized aluminium, the Esbit is light and strong, giving you peace of mind that your kit is made to last. One of the best cooking sets we reviewed. Packs away neatly thanks to the lightweight folding handle, and the whole thing is easy and quick to set up. Comes with an open style burner — use your own biomass fuel, or Esbit’s own solid state fuel cubes. The anodized aluminium is great touch, makes the whole thing feel super high quality, and cleans up easily, too. This hanging woodburner stove set is one of the best sustainable outdoor cooking combos we’ve seen in a long time. Complete with tripod and hanging hook and chain, to keep food off the floor and avoid damaging the ground. The Solo Stove features a patented double wall, to improve gasification and help fuel burn more efficiently, with less smoke. As with many of our choices at Camping Things, the Solo Stove is a biomass burner, so you can use wood, twigs and other natural debris as fuel. Recommended by serious backpackers and survivalists, the Solo Stove is sizeable enough to make cooking decent amounts of food possible, while still being portable. The stove pot itself has an 1800 ml capacity (the biggest in our selection) and because the whole lot is stackable, it packs away into your car or any large rucksack without too much of a problem. The stove set weighs around 470g. As you might imagine, the Solo Stove is made from stainless steel, which makes it easy to clean, durable and rust-proof — perfect for extreme hiking and bad weather camping. The Solo Stove’s double wall design actually cooks the smoke out of the wood, then burns it twice, making for a cleaner, more energy-efficient burn. It’s called gasifying, and it’s possible thanks to the way the stove draws in air between its layers, then uses it to effectively double burn the fuel inside. It means you’ll use less fuel to boil water and heat food. Awesome green credentials, and along with how great the pot looks hung up on its sturdy tripod, the Solo Stove is a firm favourite of ours. Essentially one small pot and a cup wrapped around a powerful little burner, the Isport is just what you need to heat a small amount of food and a hot drink. This self-contained little wonder is awesome for backpacking and camping, and the price point means it’s totally reasonable for every person in your group to own one. The Isport is built to last, and those folding handles are coated to keep your fingers from getting burnt. Isport says this stove set is good for two people, but we found that it’s about the right size for one active person on the hiking trail. At 6.3 in x 4.4 in, it’s just big enough to hold a good amount of food and drink, without taking up too much room. And weighing just 386g, it’s no hassle at all to carry. Made from high quality aluminium, the Isport is durable and easy to clean, a real contender in this review of cooking sets. One of the most versatile Cooking Sets available. You’ll need to buy the right gas canister to go in the Isport, but other than that, it’s a pretty simple piece of kit. Push the clicker to light the stove, pull out the supports and get heating. There’s a small lever on the side of the stove to adjust the flame. Even simpler than the Isport, the Optimus features a steel burner, which screws into the top of a canister. Once lit, you can control the flame with the lever on the side, and the included pots are big enough and sturdy enough to cook and boil water in time and again, with no trouble at all. You’ll barely notice the Optimus once you’ve packed it, it’s so compact. Weighing just 272g, the lightweight aluminium cups are big enough for a quick meal on the go. The Optimus is made from anodized aluminium, which is light, strong and cleans easily without any sticking. We love the coated handles, too, stops our hands from burning. The cups are of a high quality and won’t corrode any time soon. The handles are coated for your safety, and the burner unit features a cellular style grill to help evenly distribute heat. Simple, strong and well worth the money, in our book. The Kelly Kettle kit is way more than just a burner and a couple of pans. We’re seriously impressed by the range of high-quality cooking gear in this kit. Ultimate 'Base Camp' Kit (Aluminium) - VALUE DEAL. Includes 1.6 ltr Anodised Aluminium 'Base Camp' Camping Kettle + Whistle + Cook Set + Hobo Camping Stove + Cup Set (2pcs) + Plate Set (2pcs) + Base/Pot Support + Carry Bag. Green Whistle has replaced the Orange stopper and lets you know when the water has boiled. The Kettles fire-base has been upgraded to steel. All the accessories are Stainless Steel. Weight: 2.67kg / 5.87lb Excluding packaging. For Camping, Fishing, Scouts & Emergencies.